Because They Can’t Engage — Smear Skeptics New Propaganda Piece Out By Greenpeace!!! Same As The Old Propaganda!!! Oh, what fun! We’re back to recycling old smear tactics against skeptics. Greenpeace has a ….. well, I don’t know what it is. Just a bunch of old recycled smears. Which is fine. 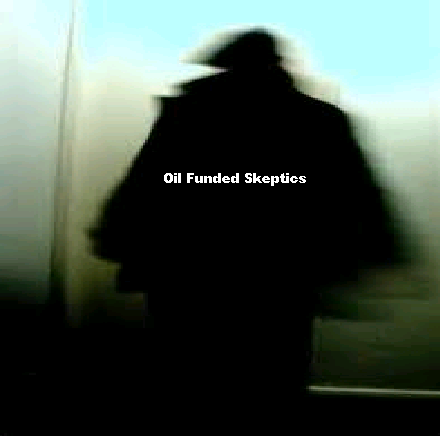 Most are from the self-delusion that most skeptic voices are funded by the sinister “BIG OIL“!!! And, they attack some personalities in the skeptic community. You don’t me to list them, you know them by heart. They argued that scientific modelling [sic] showing polar bear populations were threatened by climate change could not be trusted. They went on to question not only the climate science showing that the Arctic was warming and sea ice was decreasing, but also tried to show that things like tourism were a much bigger threat to polar bears than the disappearance of their habitat. They also criticized the work because, because…. Exxon!!!! That’s why!! And, there were a couple of fellows who disagreed with them, so there! Well, those guys certainly can’t trick Greenpeace! But, Greenpeace seems to have left some things out. Namely, that the polar bear population is growing. As it turns out, at least on the points about the poor polly bears, the skeptics were right, hunting is a greater threat to polar bears, even if Exxon one time funded one of those guys. Weird! Then Greenpeace resorts to their own bit of trickery. CAN’T PUBLISH A PEER-REVIEWED ARTICLE? SELF-PUBLISH A BOOK. Hmm, so those 1100+ papers at poptech’s don’t really exist? More than that, Dr. Lindzen isn’t published? Dr. Christy isn’t published? Dr. Spencer isn’t published? and on and on ….. For those who may not know, yes, they are all skeptics, experts in the climate field, and collectively they probably have somewhere between 500-1000 published themselves. But, about those non-experts …. people should ask Dr. Steig if they can or can’t get papers published. It seems, Greenpeace is exercising some tricks of their own in putting out this so tiresome bit of propaganda. There’s much more to laugh at Greenpeace about. Most of the arguments, we know by rote already, anyway. So, if they ever convince someone else of their lunacy, we can expect to have some more fun at alarmist expense! 19 Responses to Because They Can’t Engage — Smear Skeptics New Propaganda Piece Out By Greenpeace!!! Same As The Old Propaganda!!! I am getting real tired of buying my own gas when the oil companies are supposed to be paying ME! I’m waiting on my check too. I gave up! I’m one of the 35%, in America, who gave up looking for employment. I know!!! I keep checking my mailbox! I’ll call the Koch brothers one more time and give them my address!! ” climate denial scientists ” ??? Scientists who study people who deny that there is a climate? Denialogists? Even for EU commission ordered propaganda that’s pretty weak. Maybe they don’t pay the Greens as much as they used to. They got the part about Muhammad and Aysha right. Obama’s guys doing what they’re paid for. Warning. Page contains photo of a beheading of a captured pro-regime militia man. Executioner uses a sword; holds in his other hand what looks like a bonesaw. Even if they do not know who Karl Marx is, the people are stupid. No one should be giving that information to any clown on the street! Yep! BUT he tells them Marxist / Communist… If I didn’t know who Karl Marx was – those other two words……………………..